Everyone’s greatest wish is to have a guidebook to life. Yellow caution signs to apprise you of impending danger, road markers to let you know just where you’re going. As a college student, independent for the first time, you’re especially in need of your own little guidebook. And the Campus Clipper has provided you with just the one. 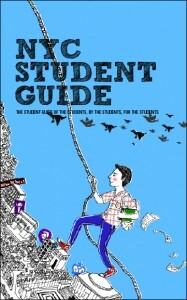 Check out our new book, the NYC Student Guide! Written by students just like you, the NYC Student Guide contains over 30 sections on pertinent topics, such as dorm living and health. Learn how to solve that roommate snafu or cook up an affordable meal. Our guide is available for pre-order at the affordable price of only $9.95. Email us at clip@campusclipper.com to pre-order your copy today, right in time for that often hectic spring semester. Now you’ll be prepared with the only book you’ll really need (although those pricier textbooks sometimes come in handy as well)! The NYC Student Guide also showcases the myriad talents of college students. While studying, many students stretch their creative wings in hundreds of areas, including dance, theatre, and choir. The Guide’s entertainment section lets you know where to let your skills (whatever they may be) shine. Just like our rewards magazine Student Maximu$, our new guide directs you to the best dance clubs, music venues, and other artsy spots in NYC. To offer you a sneak peek, the “On Culture” section advertizes KGB Bar, The Knitting Factory, Dizzy’s Jazz Club, and many more. “On Culture” was written by recent graduate Maya Klausner. Maya is a contributing writer for Examiner.com. She also performs stand-up comedy at venues throughout New York City. Check out her webpage at http://www.examiner.com/ny-in-new-york/maya-klausner. During my freshman year in college I experienced my first Thanksgiving away from home. My solo Turkey Day was something of a mixed blessing. On the downside, there was no way to enjoy Grandpa’s turkey or my mom’s homemade pumpkin pie. I made an attempt to follow Mom’s original recipe, but botched it up somehow. The pie wasn’t sweet enough, and the crust crumbled everywhere. Obviously, it needed my mother’s touch. But on the upside, I could avoid my crotchety Uncle Gerard and my bratty nieces this year. And I could hang out with my friends; we all headed out to eat Bar-B-Que, then to the local bar to wash down that turkey. So even with the absence of my mother’s pie, I enjoyed my holiday. Like me, you’re probably experiencing this Thanksgiving away from home and hearth. But fear not, you’re studying in one of the hottest holiday spots, NYC! From the mammoth Macy’s Day Parade, to ice-skating at Rockefeller Center, there’s always something to do this Thanksgiving. Don’t have time to cook this year? (Or want to avoid a mishap like my pumpkin “pie”?) There are plenty of eateries you can hit up in NYC. And you don’t even have to go that traditional (and sometimes blasé) turkey-and-stuffing route. Try Japanese Bar-B-Que at Gyu-Kaku Restaurant. Enjoy anything, from Bistro Harami Hanger steak to Japanese sausages. Gyu-Kaku also has a Thanksgiving Day lunch special—all you can eat for $27! Then stay for their Happy Hour, from 3pm to 10:30pm. Check out more of their specials at www.gyu-kaku.com. Maybe singing is your forte. If so, you should check out the ultra hip bar and lounge Karaoke Boho this Thanksgiving. Great food, drinks, and a wide variety of songs. Belt out some Alicia Keys or perform a British ballad from Oasis. Karaoke Boho is at three different locations: 196 Orchard St., 186 West 4th St., and 54 East 13th St. And don’t forget to take advantage of their student discount. Get 50% off your reservation Sunday through Thursday, and 25% off Friday through Saturday. Our new book, NYC Student Guide, will let you know of hot spots like Gyu-Kaku and Karaoke Boho. The Guide features articles on food, entertainment, health, and many more. Email us at clip@campusclipper.com to preorder you copy today! At only $9.99, the Guide is much more affordable than a textbook, but just as essential to your student experience. Once classes were over for that day, I headed back to the dorm and used my suitemate’s cell to call up my parents and boyfriend back home. I’d be incognito for a couple days, I informed them sadly. Till I got time to buy another lifeline. Eventually, I did get another phone, the cheapest I could find. A $45 Samsung; no camera, limited internet capabilities, but plenty of dropped calls. I consoled myself with the fact that I could at least call home again. Maybe you’re a student in the same situation as myself—cell-less, or at least, craving an upgrade. But you don’t have to settle for a $45 Samsung like I did. You may want to take advantage MetroPCS’s deals. They offer plans for Blackberry phones at a flat rate of $40 a month! This comes with unlimited talk, text, and web. So obviously, you have a lot of options. Get a great deal on a new phone. Just make sure to not drop it in the toilet! For my second semester of college, I was growing tedious of science and mathematics classes. The cosign of whaa?? One morning, my left brain aching after an hour-long session trapped with Dr. Monroe in Calc 101, I happened to wander by the art building. Intrigued, I stepped inside. A cool white hallway greeted me, its walls adorned with paintings and drawings of every subject matter available. It was like entering a mini Metropolitan Museum of Art. The talent of those student artists amazed me. I wanted to produce something like that. Next semester, I got my chance. When Spring enrollment rolled around, I was the first to sign up for Art 101. See ya Dr. Monroe, time to let out my inner Picasso! While relieved to give my left brain a break as I produced the next Les Demoiselles d’Avignon, I was quickly stunned by the price of the art supplies I needed. I’d already dropped nearly $300 for textbooks, now I had to buy sketch books, paint brushes, and charcoal?! Unfortunately, at that time, I wasn’t aware of student discounts on art supplies, so I paid full price for the tools of the trade. Truly, I’d become a starving artist. But you, dear student, can take advantage of A.I. Friedman’s 10% discount. A.I. Friedman lets you explore your creative side at a great price! Now you can afford that artist’s residence in a Soho loft. Also, don’t forget to check out our website for additional art supply coupons, including this one for Blick Art Materials. The term “organic” can come with many preconceived ideas. As a kid, I always grimaced when my health-conscious mother brought home organic “treats” such as wheat-grass shakes or tofu banana puddings. If I had any residual disdain for organic dishes, Bare Burger has eradicated my juvenile notion that taste had to be sacrificed for healthy, organic ingredients. Bare Burger, first conceived in Astoria by six Greek brothers, has sprouted another branch in Greenwich Village. Upon arrival my boyfriend and I were graciously welcomed by manager Mischa Levine, who was to be our guide during the Tour de Force sampling of the lunch and dinner menu. We felt like gods to be fattened. While the first batch of food was freshly being prepared, Mischa introduced us to the Bare Burger beer and wine selection. Almost all the beers and wines are organic or only lacking in the pricey authoritative seal. When it came to the wines, Mischa knew most all the vendors and which local communities the grapes were grown and harvested before distribution. For teetotalers there are also options of organic ice tea, organic lemon-lime lemonade and wide array of organic sodas. My mouth moistened and stomach rumbled with Epicurean anticipation as trays of russet potato fries, chicken tenders, and flaky onion rings were first brought out with a haloed ring of dipping sauces. As wonderful as these fried appetizers were, they seemed to be more of a vehicle for trying all of the sauces. Some of my top favorites were the malsala ketchup, a smoky-sweet barbeque sauce that goes really well with the ostrich burger, the pesto mayonnaises, and agave nectar mustard. Then came a promenade of sliders: trays of beef, turkey and ostrich burgers were compacted next to a chicken club sandwich and hot dog filling our booth with carnivorous wafting. 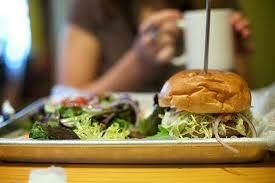 The pairings of complimentary flavors in the burgers and sandwiches were indicative of a burger-artisan. The classic beef burger is the platonic representation of the ideal burger: tender meat, fluffy brioche role and a special sauce with the usual tomato and lettuce accoutrements. The chicken club sandwich gives a strong kick, Cajun style that is simultaneously balanced and cooled by creamy avocado wedges. My particular favorite, the turkey burger, has the smokiness of organic bacon coupled with the sweetness of a grilled pineapple ring. What was most satisfying however during the meal was how animated Mischa was in detailing the background for most every ingredient. Why he chose particular vendors for the organic ice cream or where he was supplied the organic ketchup and agave sweetener flirting their chemical-free purity on the tabletops. He relished in the fact that all the meats were organic, prepared to order, and of the highest quality. The term organic became a dulcet, alluring golden ticket for consuming everything presented, sans guilt. After courses requiring vigorous mastication, I was grateful that our last was purely liquid. A silver tray displayed old-fashion shakers, holding frothy-organic milkshakes. We sampled flavors of chocolate, pistachio, chocolate-raspberry, and “Steve’s Special” which was part chocolate, part vanilla, banana and peanut-butter all delicately combined by the Jedi-Master of Milkshakes: Bare Burger’s Steve. This ethos of community applies not just to the food, but the overall atmosphere. Even the adornments of the restaurant contain their own narrative: the storefront is a cheerfully refurbished yellow garage door, the wooden tables were garnered from excess driftwood and our booth was canopied with a glistening recycled milk bottle chandelier. Admittedly, I went back two days later. And after a couple moments of sheepish gluttony, I eased back into the same booth with the feeling of comfortable chumminess. And that’s just the type of customer base Bare Burger will attract. Bare Burger’s menu is the type you want to woo repeatedly for dinner, lunch and even breakfast- not the late night quickie when anything in the realm of edible will suffice. The health devoted and foodies alike will find dishes to delight over and a restaurant to commit to. Get a STUDENT DEAL for Bare Burger here!